Some of the most beautiful words in the Bible are found in Matthew 5: 1-12. In fact, they are called “The Beatitudes” because of their beauty. 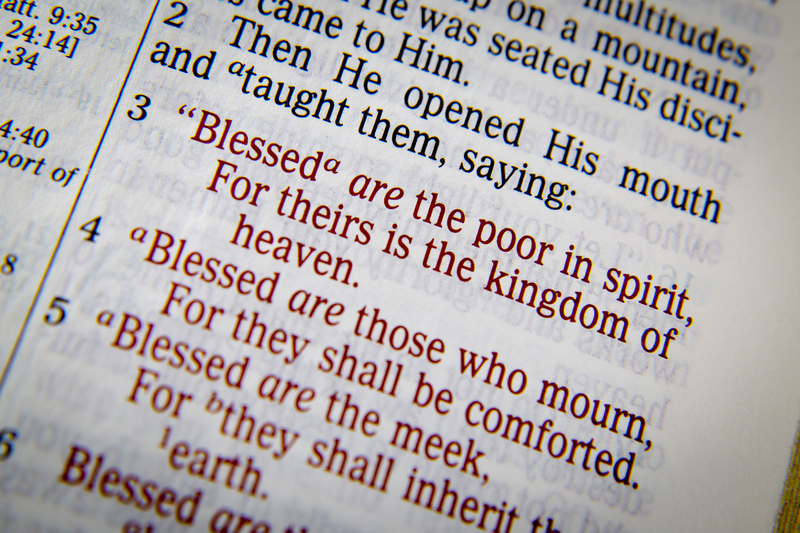 The first Beatitude is “Blessed are the poor in spirit for theirs is the kingdom of heaven.” I have struggled to understand exactly what it means to be “poor in spirit.” Being poor means being without financial means. But how can we be poor in spirit and why does Jesus call us to be poor in that way? According to Billy Graham, being poor in spirit means to have a humble spirit. That makes sense, but later in the Beatitudes, Jesus says “Blessed are the meek for they will inherit the earth.” It seems to me that meek and humble have the same meaning. That leaves me still wondering what it means to be poor in spirit. There is a story I have heard in church about a man who was asked to give God a gift. The gift had to be something that was totally of his own making. The man offered many things to God, but each one was rejected because it was not totally of the man’s own making. Each gift had required the man to use raw materials and skills that God had provided. Finally, in desperation, the man brought God his sin. That was the gift that was accepted by God. It was the only thing that was totally of his own making. I think that is what it means to be poor in spirit. It means to recognize that there is nothing we have or will ever have that is not from God–except our sin. It is the only thing that is totally of our own making. God wants us to come to Him in our weakness and sin, recognizing our unworthiness. And he will take that gift and make it something beautiful.